Telecom Italia’s new CEO adopts a leading position for network performance according to our latest crowdsourced results for Italy, as TIM perform best for both upload and download speeds and overtake Vodafone for latency across the country. With average results of 19.95 Mbps on both 3G and 4G, TIM perform best for download speeds across the country. Vodafone place second, managing just 13.93 Mbps, closely followed by Wind and 3 in third and fourth place respectively, with average results of 10.62 Mbps and 9.31 Mbps. We see similar results when we looked regionally, with just one exception in Veneto, where 3 moved up to third place ahead of Wind for 4G download speeds, scoring 16.49 Mbps between August and October. Upload speeds follow a similar pattern, with 3 just inching ahead of Wind to take third place on 4G and second place on 3G. TIM also lead our latency results for the last quarter across Italy with an average score of 29.9 ms on 4G, marginally ahead of second place Vodafone who averaged 30.6 ms. TIM also perform best on 3G, where 3 take second place, followed by Vodafone and finally Wind. Vodafone perform much better in Lombardy and Veneto, taking the 4G latency lead away from TIM with average scores of just 21.4 ms and 26.9 ms respectively, but drop to third in Lazio where they can only manage 34.8 ms.
Each operator in Italy suffers from some degree of network stability according to our latest crowdsourced tests. 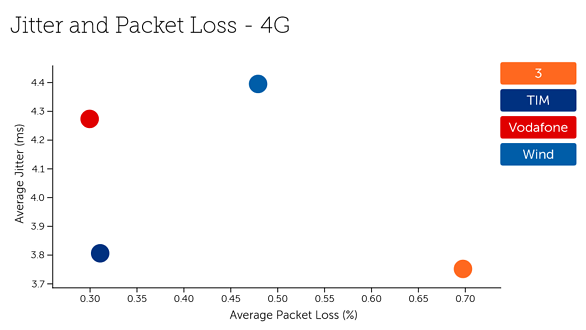 Vodafone perform best for average packet loss, but are let down by their jitter results. 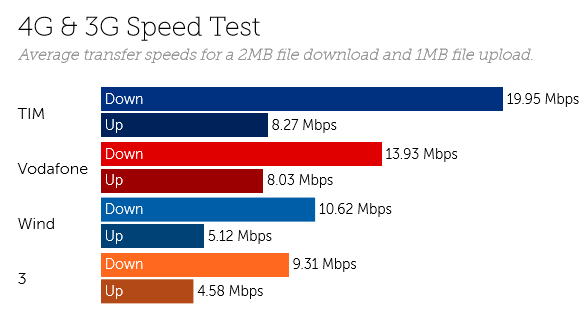 On the contrary, 3 perform well with low jitter, but suffer from much higher packet loss than Vodafone. We recorded high packet loss and jitter for both TIM and Wind between August and October. Our findings for Italy are based on 6.09 billion network quality measurements including 575 thousand speed tests between August and October 2018. Our latest complimentary Mobile Experience Report is available to download from the Tutela Insights portal.